I remember the first time i heard the word ACTIVISM- before i got admitted into the university and there was always some news on the television about one form of student activism or the other- either students protesting a lack of social amenities or hike in school fees. These protests were usually characterized by the carrying of placards, sticks, chanting student union songs and slogans etc. Then came the era of labor unionism, which in another way defined activism for me and a lot of Nigerians as facing off with government and going on strikes. The above mentioned examples and some others that easily come to mind give the impression that activism always has to be violent and angry. Indeed, there are times when one has to get angry enough about the situation to want to change things, to say enough is enough. Activism is however a lot more than that. 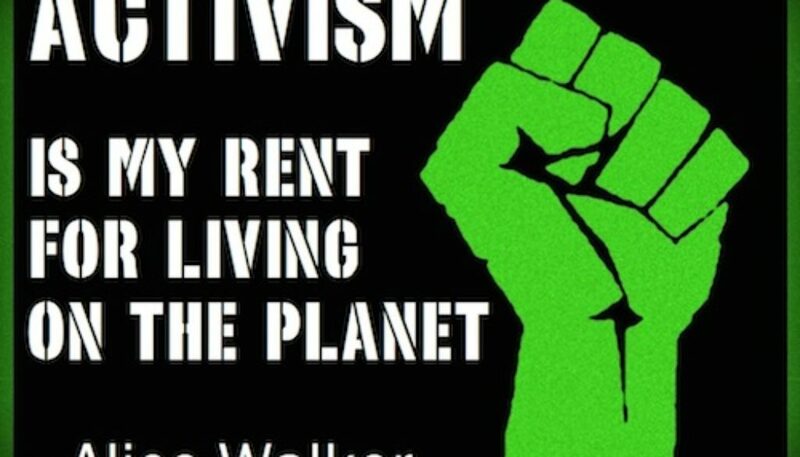 The term activism in itself is quite contentious and has been the source of many debates with different definitions from different points of view. A popular definition of activism captures it as being “an engaged citizenry”. Meaning that activists are generally citizens who are concerned about and take steps to address issues of public concern. Any issue that affects public life should concern us all. Ergo, we should all be activists. Be knowledgeable about the issues – knowledge they say, is power and one can never underestimate the power that lies in being equipped with the right type and amount of information. The only way to engage effectively with the issues is by being properly informed. So, do your research, ask question and dig deep until you get all the answers! Be ready to engage – it should not stop at being equipped with the right type and amount of knowledge alone. It is pointless if you have the information and you are not ready to put that knowledge to work; all that energy and effort put into acquiring it would have just been wasted if you do not enagage! Find a space/niche – there may be that little voice in your head telling you that you are the only person alive on earth who is interested in bringing about social change. This is farthest from the truth. There are many others who are interested in the same issues as you and who are also equipped with the information you have. So, what gives you the extra edge? The answer is your niche (that space you have created for yourself, that people can identify you with). Don’t get me wrong – you do not have to start an organisation or movement or enterprise to create a niche for yourself – you can find an organisation or movement whose vision/mission/aspirations tie very closely to yours and join them or collaborate or even volunteer. Resist the temptation for quick glory. Rather, understand that you need time to learn and mature and a great way to do this is by learning from those who have been in the game longer than you and who have more experience. Walk the talk and talk the walk – a lot of people will argue that we have too many talkers and very few doers. While i may have certain reservations about the generalization a lot of people accrue to this statement, it is not entirely false in itself. Oftentimes, we find out that we have so many people making so much noise about an issue, especially on social media but, when it gets down to the nitty gritty; to actually getting down to the real work of doing, only a few are left. True activists are known by their actions, not their words. It may be something as simple as stopping in front of a zebra crossing while others are driving past or stopping at a red light while other drivers zoom past or you may decide to be like Mahatma Gandhi and go on hunger strike as a way of disagreeing nonviolently with a popular opinion. Whatever way you choose, just make sure your actions speak for you and people can identify you as a real change maker. Be authentic – a friend once told me that passion comes from authenticity and i find this to be very true. When your passion stems from a place that is very real, there is no limits to the impact and influence that you can have on people around you. Tying all of this to the work we do at connected development, we may not take to the streets , carrying placards and chanting (we do not need to). But the sound of our activism echoes loud and clear. We are breeding a community of revolutionary individuals who see governance as a partnership between the governed and the governing; each playing his own part at ensuring a society where social justice and equity prevails. We are breeding a community of social change experts, a community of concerned citizens and this is essentially what activism is all about.